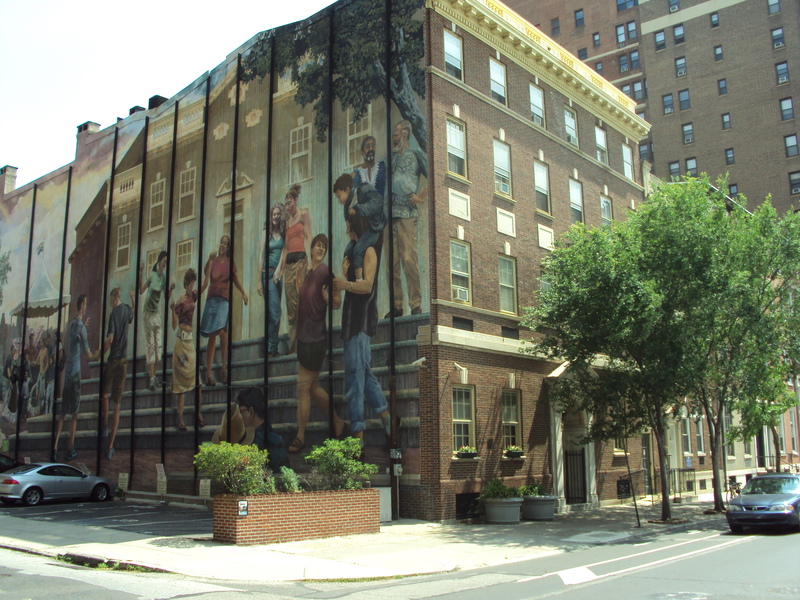 This is the second part of the story of the building at 1315 Spruce St., in the heart of Philadelphia’s Gayborhood, that houses the William Way Community Center and its splendid “Pride and Progress” mural. 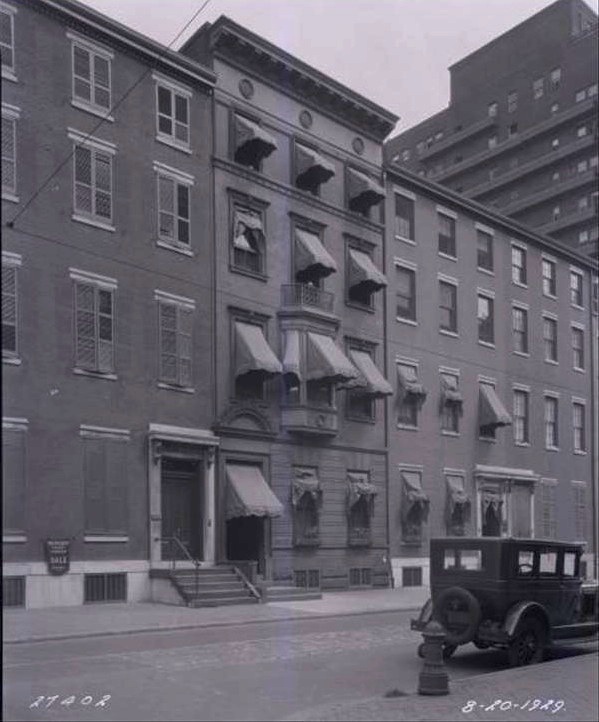 In 1907, the Engineers’ Club of Philadelphia on Girard Street, (now Ludlow), was looking for a larger space to use as a clubhouse. The club had been formed in 1877, sparked by the meeting of engineers from all over the world at the Centennial Exhibition in Fairmount Park the year before. In November of 1907, they purchased the old Potts residence at 1317 Spruce St. for $55,000, see newsapaper clipping, right. They entirely renovated it, putting in a smoking room, dining room, and library on the first floor, an assembly room on the second floor and a rathskeller and billiards room in the basement. The third and fourth floors were divided into small residences for the members. Most of these are offices today. The Engineers’ Club held its first meeting in their new home in December of 1907, which also marked its 30th anniversary. The photo, left, shows the old Potts building with its second floor central bay window. To the left is the edge of 1319, which is where the parking lot now, and to the right is 1315, which has since been rebuilt. 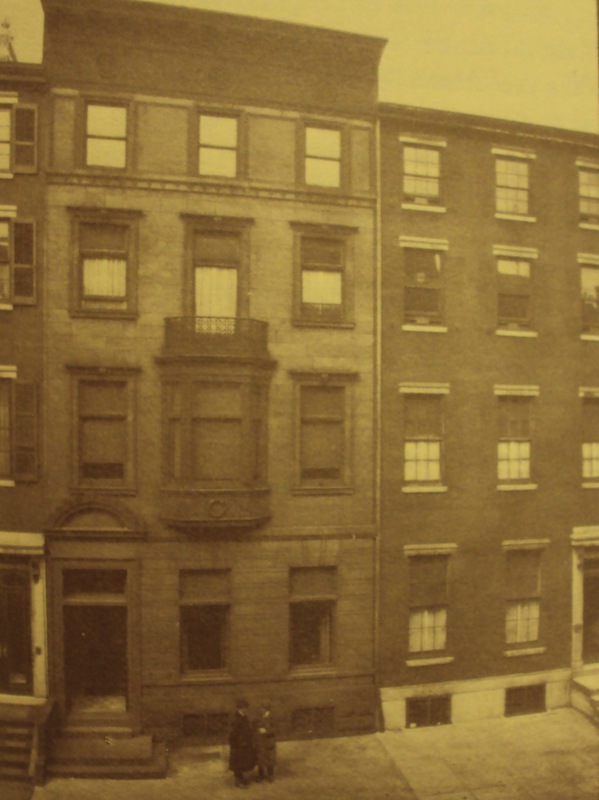 These two buildings show us what the entire original row of 1840s houses on Spruce St. looked like. Of those original rowhouses only 1305, 1309 and 1311 remain today. Membership continued to increase over the next ten years and the club rented out offices in the building to other allied oganizations, much as the WWCC does today. Once again, they needed more space. The engineers were able to negotiate with the owners of 1315 Spruce and began to raise money to purchase that building. 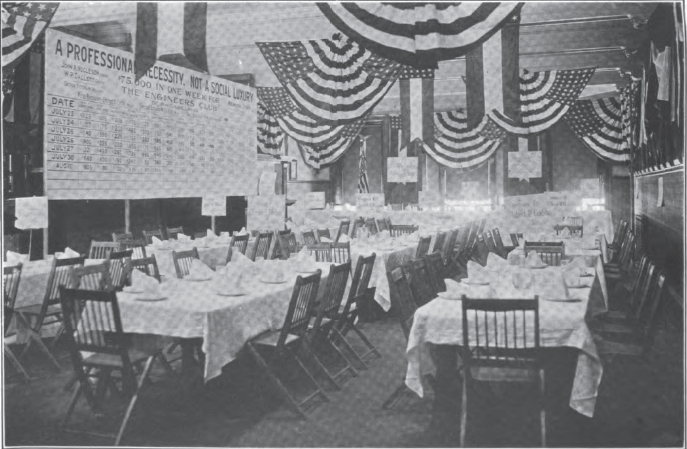 The photo, above, shows the second floor assembly room, spanning only three windows instead of today’s six, set up for the campaign to raise money to purchase the building next door. It was, in fact, the need for a larger assembly room that had been the major factor in deciding to expand. In 1917, they did combine the two buildings. The plan was to carry out much of the initial work in a few weeks, to make the first and second floors as useful as soon as possible, see original plans, above. You can see the new parlor and lounging room for the men and a new “ladies’ dining rooom” – this was still very much an all male club. One of the problems was that the floor levels between 1315 and 1317 were no longer even since 1317 had been entirely rebuilt by Mr. Potts. Importantly, the second floor renovation would double the size of the assembly room, allowing for a projection booth – very high tech for 1917. The engineersʼ Proceedings mentioned the difficulty in finding a steel beam that would span the third floor floor, allowing for an assembly room without support columns. (This is the same beam everyone needs to climb over today to get from the elevator to the third floor offices). The picture, left, was taken in August of 1929. The Engineersʼ Club space now occupied the two very different looking buildings with awnings in the center. To the left, most of 1319 is also visible, and to the far right the Lenox Apartments, which had been constructed in 1917. 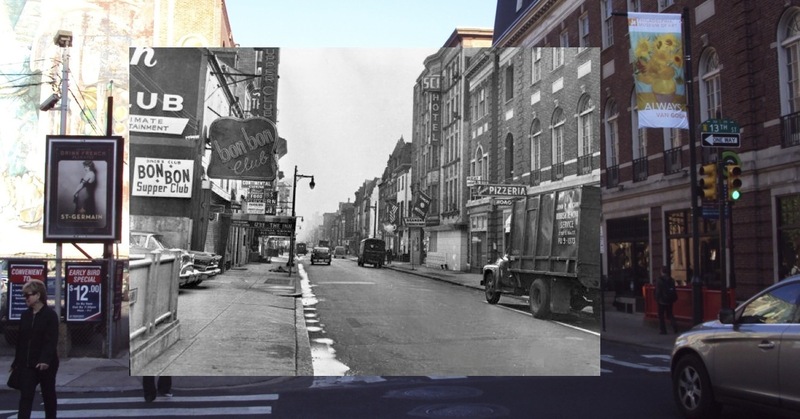 It still doesn’t look at all like the building we see today.